GLASS RECYCLED has officially launched its new website and online store, allowing customers to learn about the complete line of recycled glass products as well as place online orders. The GLASS RECYCLED website features in depth product descriptions, specifications documents, LEED assessments, a designer showcase, multiple image galleries and a complete ecommerce system that accepts orders twenty four hours a day seven days a week. “The Glass Recycled web portal gives designers and homeowners a chic, eco-friendly option for kitchen countertops, flooring, tabletops and more,” - explains Dallas website designer, Christopher Oliver. Customers now have the ability to place orders for any of GLASS RECYCLED’s sample materials as well as create a custom made sample by choosing an epoxy color and then choosing which colors and sizes from a variety of recycled glass aggregates. All of the interaction takes place on the website in the ecommerce store. 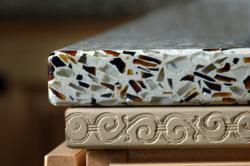 Additionally, custom countertops, flooring and tabletops can be ordered in the same manner. The process begins with the GlassEPOXY selection. There are many preferred color codes for GlassEPOXY; however, should a customer wish, it can be color matched to any Benjamin Moore or Sherwin Williams paint color code. This enables homeowners and designers an incredible range of possibilities. The customization continues with the ability to select up to five GlassSCAPE aggregate options. These include GlassAMBER, GlassBLUE, GlassBROWN, GlassCLEAR, GlassGREEN, GlassMirror, GlassMODE (recycled porcelain), GlassMOP (mother of pearl), GlassOLIVE, GlassPLATE (plate glass), GlassRED, GlassORANGE, and two colors of GlassSHIELD (recycled auto glass). There are also a variety of size options that vary depending on the GlassSCAPE color selected. In addition to a complete online store the GLASS RECYCLED website also features several interactive photo galleries that showcase the products installed in a variety of locations. “By building several image galleries it allows customers and designers can see the product in a variety of real world settings. The more information available the better customers can image the possibilities for their own projects,” explains Dallas SEO specialist, Oliver. The GLASS RECYCLED website is now completely live and operational at GlassRecycled.com.